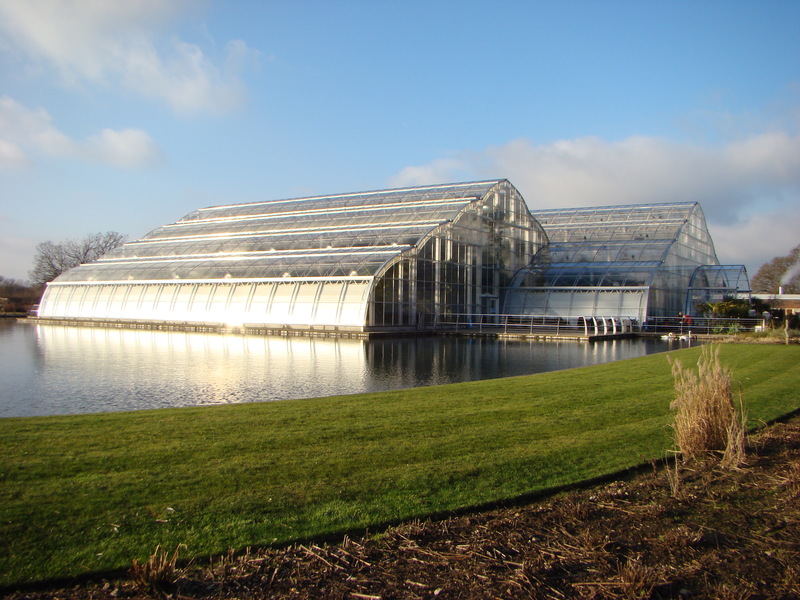 RHS Wisley, near Woking in Surrey, is the flagship garden of the Royal Horticultural Society. Gifted to the society in 1903, it has evolved over time into a world class garden. There is something to see whatever the weather and today the kids and I went to see the magical Butterflies in the Glasshouse, an event running until 24th February. The Glasshouse is a huge cathedral-like glass structure covering an area equal in size to 10 tennis courts. It has 3 climatic zones, recreating tropical, moist temperate and dry temperate habitats. The Butterflies event is in the tropical zone. With a minimum night temperature of 20°C (68°F) and a relative humidity of 65-70 percent, this zone has an environment similar to a tropical rain forest. The combination of heat and moisture promotes fast growth, immense leaf size and extravagant, brightly coloured flowers. The butterflies arrive at Wisley as Chrysalis and they are hatched out in a special environmentally controlled chamber. Every day they are checked and released into the Glasshouse. There is a large range of butterflies to see including the stunning Blue Morpho, the Achilles Morpho, the Tailed Jay, the Great Yellow Mormon Swallowtail, and the Owl Butterfly. I wasn’t entirely sure how the kids would react to having all the butterflies flying freely around. Seeing them in the garden is one thing, even rearing them from caterpillars (as we spent last summer doing) and then releasing them is still very different from being in a large greenhouse surrounded by them. And the ones at Wisley are much, much larger than any I have seen in the UK! I needn’t have worried however, as they all loved it! After we’d seen the butterflies (twice as we had a toilet and lunch stop in the middle!) we did some exploring of the lake and the Jubilee Arboretum and then ended the day by climbing the Fruit Mount a few times! Wisley is a fantastic palce for a day out, whatever the weather. There is plenty to see and do for the whole family. I would highly recommend Butterflies in the Glasshouse; I know we will be going again before the event finishes!